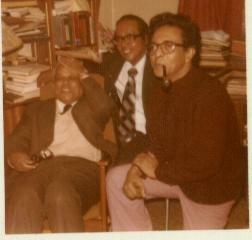 Vernon Corea was a loyal student of Royal College Colombo, one of the finest educational institutions in Sri Lanka. It was a fitting tribute to Vernon that the Royal College flag was draped in front at his funeral service at Emmanuel Church in Wimbledon Village in London and at the memorial service at St.Luke's Church, Borella in Colombo. Many Old Royalists attended both occasions to remember Vernon. 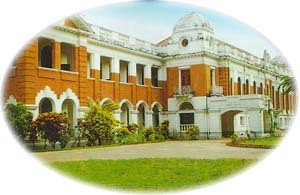 He was at Royal Prep School in Colombo from 1931 to 1938, moving on to the senior school 1939-1949. Vernon was a founder committee member of the Royal College Old Royalists Association in the United Kingdom which was set up in London in 1983, Vernon was actively involved in all their functions and events in the early years, together with his cousin Gamit Amerasekera. J.C.A.Corea, Vernon's grand uncle was the first Ceylonese Principal of Royal College Colombo. The official Royal College website - click on the photograph of Royal College Colombo above - details the accomplishments of James Clifford Aelian Corea. Click on the Royal flag below to find out more about the Old Royalists Association in the United Kingdom. Two leading Colleges in the island, Royal and Trinity, have with oneness of mind and spirit, agreed after a lapse of years to revive their traditional hockey fixture - which takes place today Thursday October 14, with the under 17 match at 3.30 p.m. and the under 19 game at 4.45 p.m. at the Trinity College grounds Asgiriya. The two encounters that are to take place are historic, in that it marks the inauguration of the J.C.A. Corea Cup for the winners of the Senior match and the Paul Jeyaraj Trophy for the winners of the under 17 game. Both awards would be annually presented to the respective winners. It's better late than never, and it's indeed most fitting, that the organizers perpetuate the memory of the late J.C.A. Corea, the former Principal of Royal by awarding this Challenge Cup annually in his name. As an Old Royalist, Corea after obtaining his masters in Psychology from the University of London and Diploma in Education (Cantab) taught at Kingswood and Wesley before being appointed as Vice Principal of Royal in 1943. He was the deputy to the illustrious E. L. Bradby, a fine partnership indeed in those glorious years of Royal. Corea succeeded Bradby in 1946 as the first Sri Lankan and first Royalist to hold this distinguished office, as Principal. Though endowed with a stern exterior, he was inwardly a kindly man. A strong disciplinarian, who believed in the adage 'a sound' mind in a healthy body and, so encouraged the acquiring of knowledge, the promotion of sports and the fostering of the arts. Towards the end of his tenure at Royal, he was instrumental in entrusting his good friend and colleague the late Lennie De Silva to introduce the game of Hockey at Royal. On retiring prematurely from Royal in 1954 he was Warden of Hall of residence at the University of Ceylon, Peradeniya and later served as Warden of the Ceylon students centre and education officer of the Ceylon High Commission in London. Paul Jeyaraj of Trinity like Corea of Royal, was held in high esteem and regard, as a committed outstanding educationist. His invaluable contribution to Trinity in general and Hockey in particular, spanning for a period of 45 years is verily a sacrificial labour of love. Paul was the live wire of Hockey at Trinity, Kandy schools and Sri Lanka schools. And so quite deservedly Royal and Trinity will remember Corea through this Challenge Cup named after him and, as well recognize and appreciate the services rendered by Paul Jeyaraj by the Challenge Trophy donated by him. Both awards will be presented after the two hockey matches on the 14th of October at which, Paul Jeyaraj will be the chief guest. 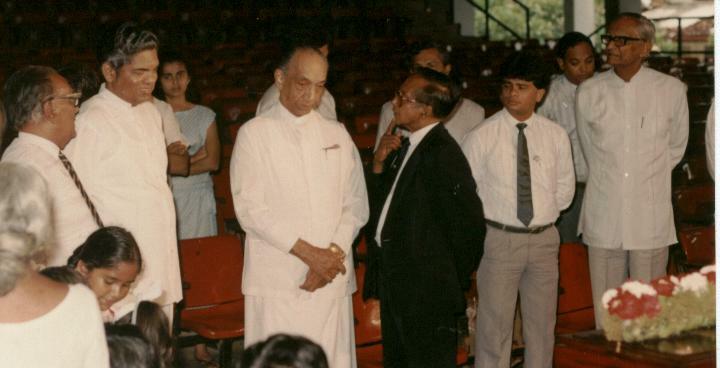 The photograph below shows Vernon and members of the Corea family at J.C.A.Corea's funeral with distinguished Royalists - the President of Sri Lanka, His Excellency J.R.Jayewardene, Minister Lalith Athulathmudali, SLBC Chairman Livy Wijemanne paying their respects at Royal College, Colombo.